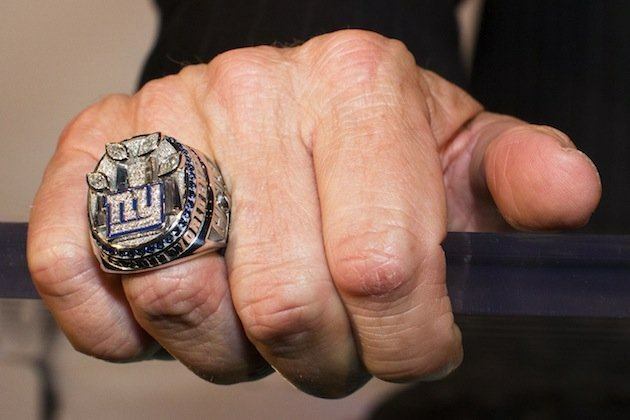 The New York Giants received their Super Bowl XLVI rings in a special ceremony in NYC on May 16th, 2012. The rings were designed exclusively by Tiffany’s with the idea that bigger is better! The players wanted something that could be seen from miles away. With that in mind, each ring contains four Marquise loose diamonds in four Lombardi trophies (which corresponds to the four titles earned), 37 blue sapphires (to match their teams colors) and the dates of each Super Bowl title. The words “finish” and “all in” are proudly engraved on the ring which symbolizes the teams inspirational words used in the 2011 title. Their winning score against the New England Patriots is engraved on the rings shank as well as the player’s name and number, and dates of New York’s other wins.